In the Augmentative and Alternative Communication class that I took two years ago, we discussed visual scenes with hotspots to help people communicate, but I had never used a device with this capability. Now, two years later, I have the Scene Speak application on my iPad and I can finally use it not only to help people communicate their wants and needs, but for other communication activities! Continue reading to hear all of the ways you can use this application and to enter a giveaway for the application! There are four different buttons at the bottom of the page and one at the top - VSD Library, My Books, Settings, Info, and Edit Mode. The "Info" page contains information about the current version of the application, user manual, application name, support e-mail, and website of the developer. Pressing the "User Manual" button will display the user manual to scroll through by pressing and swiping your finger up and down to read through the pages. There is text, visuals, and labels on each page of the manual. There are multiple settings available on the "Settings" page. 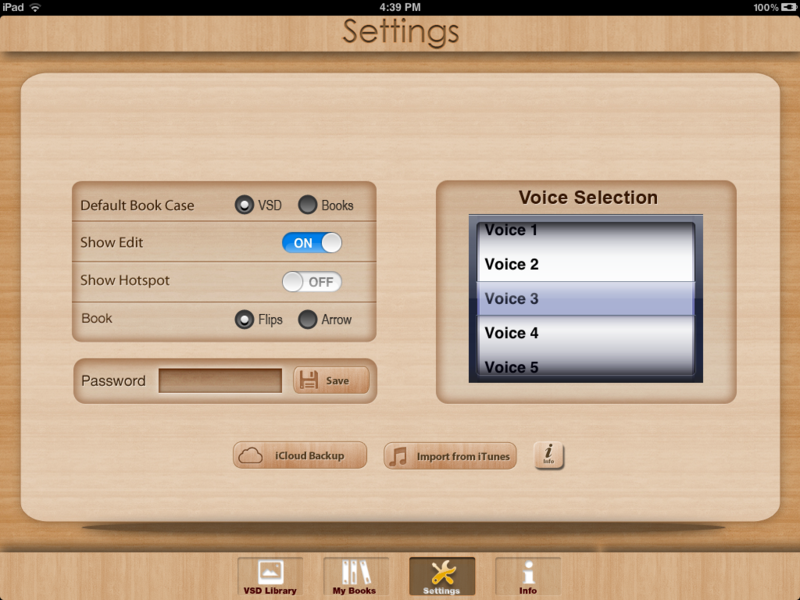 These include changing the default bookcase to the VSD or My Books, showing the "Edit" button, showing the "Hotspots", deciding between flipping the pages or pressing an arrow button, choosing between five different voices, adding a password to the application, backing up the application and its files onto iCloud, importing files from iTunes, and reading information specifically about library imports and exports. Some of these options are chosen by sliding switches, buttons, typing, and scroll wheels. This bookcase showcases books created by the user using the visual scene displays. The title of each book and image of the page on the front. There are two different modes within this application - Edit Mode and Playing Mode. Press the "Edit Mode" button in the top, right hand corner of the VSD Library or My Books page to edit the visual scenes, delete the scenes, or arrange the scenes within a bookshelf. To delete a scene, press the red circle button with a minus in the middle next to the scene. To arrange the scenes within the bookshelf, first press the "Arrange" button. Then, press, hold, and drag the scenes within the bookshelf. Finally, once you have arranged the scenes within the library, press the "Done" button. To edit a previously created scene/book, press the paper/pencil button underneath the scene you wish to edit. 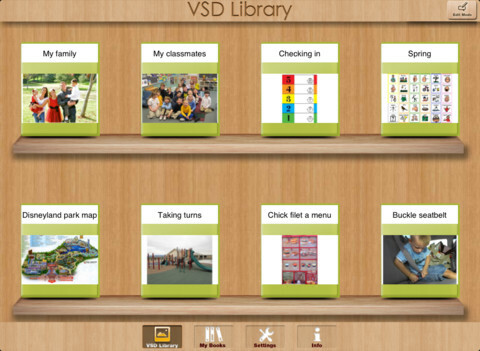 To create a new visual scene display, go into "Edit Mode" on the VSD Library page. Then, enter a title via the keyboard to your visual scene display. Choose an image to associate with the visual scene by taking a picture with the camera, choosing an image from the Camera Roll, through Google search, or through Bing search by pressing on the "Choose Image" button. You can press "Cancel" or "Apply" once you have chosen an image. Next, add text onto the page by pressing the "abc" button with a microphone. Type text into the brown box via the keyboard. You can add audio to the text as well as adjust the speed of the text. 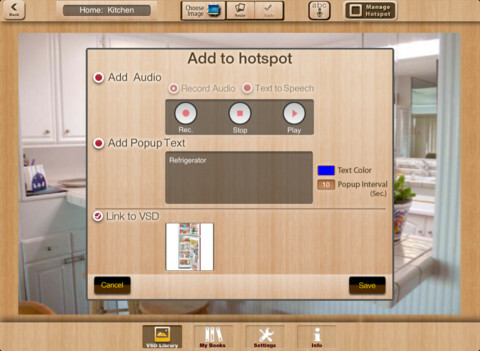 To add a hotspot to a visual scene, press the "Manage Hotspot" button. Then, press "Add" and press where the hotspot should be on the scene. Double-tap quickly on the hotspot to add audio, pop-up text, or link to another visual scene display. The audio that you add can be either recorded or text-to-speech. If you choose to record audio, check the circle and press the "Rec." button and then "Stop" once you are done recording. Press "Play" to hear it played back. If you choose to use text-to-speech, check the circle and type in the text via the keyboard that you wish to be narrated. If you choose to add pop-up text to the hotspot, check the box and then type in text via the keyboard to pop-up. You can change the text color and the pop-up interval in seconds. Finally, you can link to a VSD by checking the box and then choosing a VSD to link to. Make sure to press "Save" when you are done. Add as many hotspots as you would like on the page. To edit a hotspot, press the "Manage Hotspot" button followed by the "Edit" button. Make sure that the hotspot you wish to edit is selected on the screen. Then, you can edit the audio, pop-up text, and VSD it is linked to if you wish. The other two buttons on the "Manage Hotspot" drop-down menu are "Delete" and "Resize". Pressing the "Delete" button after you have selected a hotspot will delete the selected hotspot once you choose "yes" on the pop-up box. To resize a hotspot, press the "Manage Hotspot" button and then the "Resize" button once you have selected the hotspot to resize. Then, pinch the hotspot to the size of your choosing. It will always remain a square shape, however. To create a new book, go into "Edit Mode" on the My Books page, and then press the "Touch to Add" button on the bookshelf. Then, add a title via the keyboard to your book. Press the "Touch to Add" button to add a visual scene or "Add VSD" to choose from one of the previously created visual scene display backgrounds. Once you have added your visual scenes of choosing, press the "Save" button. If you are not already in "Playing Mode", press the "Playing Mode" button in the top, right hand corner of the application. This allows a user to play a visual scene or book. You can have hotspots shown or hidden on the page(s). First, choose which scene or book to play. The text associated with the page will be at the top and the text written in the "abc" portion is displayed at the bottom of the page. To play the text at the bottom, press on the text. Press a hotspot to hear the audio or view pop-up text associated with it, or have it go to another visual display scene. If you are playing through a book, you can move between pages of scenes by swiping on the pages or pressing an arrow button. There are so many different ways to use this application. Visuals are interactive in many ways through audio, additional displays, and text. Having visuals and audio on the application is great for people who have difficulty reading. Some people who use AAC prefer visual scene displays. You can create scenes with hotspots as well as books. Scenes and books are easy to view and scroll through on a visually clean bookshelf. Hotspots can be shown or hidden depending on the needs of the person using the application. There are multiple settings available to adjust based on the users' needs. You can set a password for the application. You can show and hide the "Edit" button so that users do not edit the visual scenes. There are five different voices to choose from or you can record your own voice. There is the ability to share boards between iTunes users. The User Manual is installed directly on the application. Now that I have had the treat of using video on an application, it would be great to use video in a hotspot. For example, in a kitchen visual scene display, it would be neat to show how to use a dishwasher via a video when the user presses on the dishwasher. 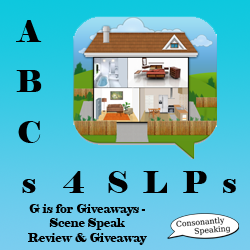 AAC - You can create a communication scene or scenes by utilizing hotspots. Place hotspots on one scene which narrate different images on the scene. Place hotspots on portions of the scene and link to other associated scenes either with words like a communication device or images associated with a certain portion of the scene. Articulation - Create a visual scene with multiple images of words that have a students' articulation sound in them. Have the student record each word on a hotspot or a sentence with each word in it. If you create a book, have them read it aloud or record the associated sentence. They can play-back their speech and re-record it if necessary. Fluency/Voice - Create a book and have students read it/record it using appropriate fluency/vocal strategies. You can even create a visual scene using cues for different strategies and have them state a sentence using their different strategies for each one shown. Expressive Language - Have students state sentences for images/pages. 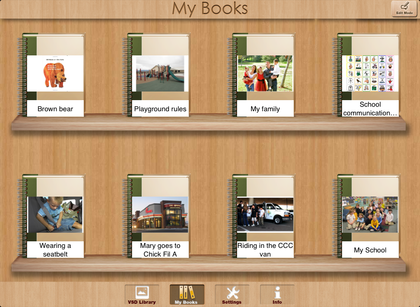 They can even create their own book using this application or associate a sentence with different hotspots on a page. Receptive Language - Recording vocabulary on a visual scene and having a child press on it would help the child learn various words. Having a student record different terms or definitions would help the speech-language pathologist determine areas of vocabulary that need further work. You can have children record their description of various vocabulary, state items in a category shown on a page, and more! Create a book on a given topic or have the student create one on his or her own. Social Stories - Create a social story using this application. 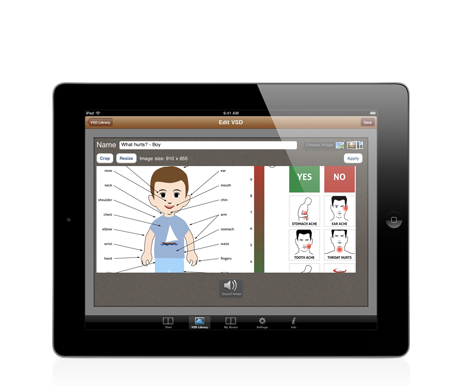 Take real-life images and add hotspots such as on different parts of the face/body to discuss body language, on the mouth for what a person might say in a social situation, or for the text of the social story. 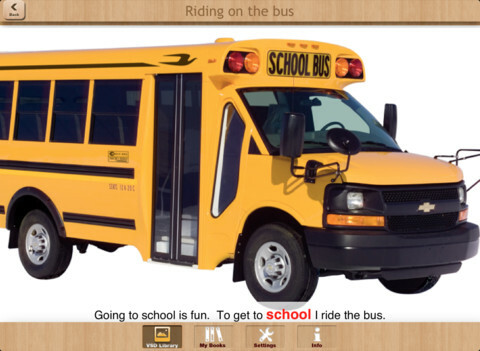 Story Telling - Create your own story or use a story online using this application. Create hotspots on different parts of the page for different vocabulary/characters/quotations/etc. Scene Speak is available for the iPad for $9.99.